Here’s a look at the Phoenix Real Estate Market for March 2018. 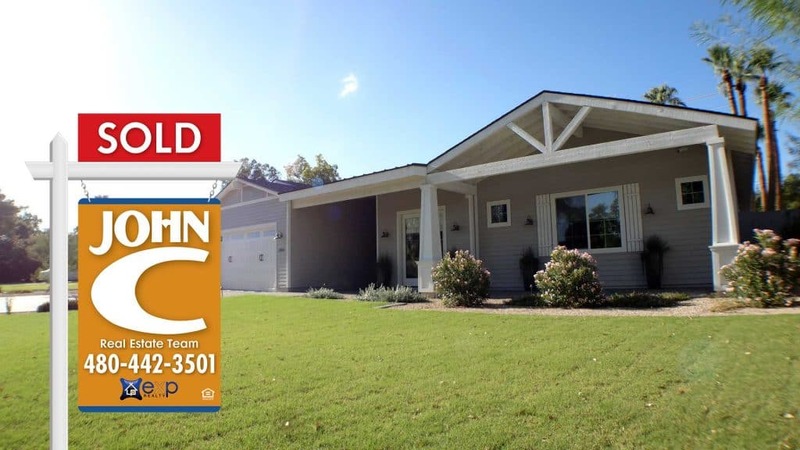 According to data released this month from The Cromford Report things ended on a strong note for the Greater Phoenix real estate market and home sales. The Phoenix Market is on the move again. Get the up to date data. See where the market is headed. Find out what happened last month. ❓What Does this Data Mean? ❓ What does this mean if you’re selling a house in Phoenix? 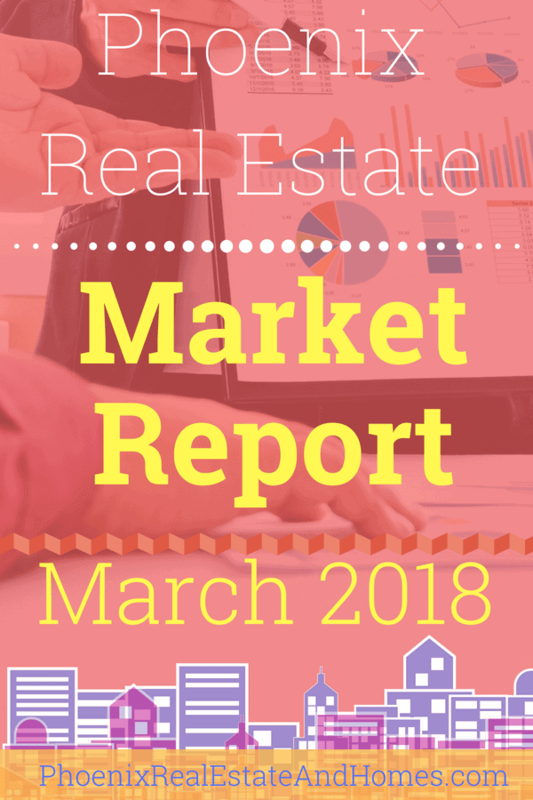 This is the Phoenix Real Estate Market Report for March 2018. 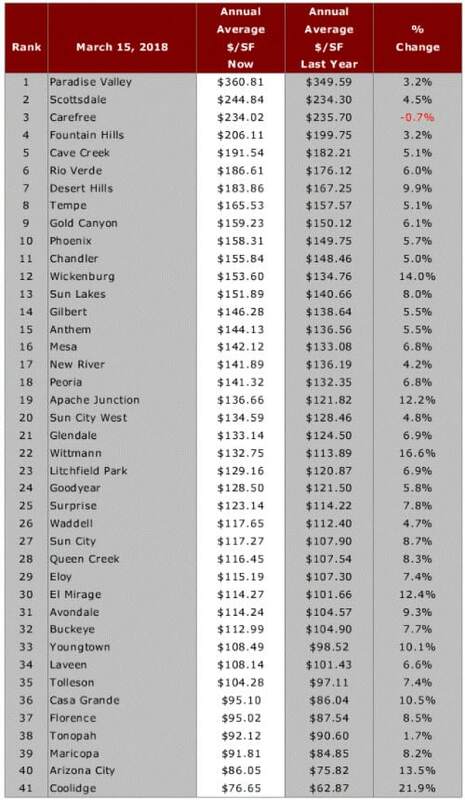 The available Greater Phoenix housing for sales and rentals are significantly under-supplied. The available homes in the ARMLS (all types) are at 16,924 compared to 19,648 at this same time last year. Can you say “housing drought”? The monthly median sales price is at $251,000. Twelve months ago it was $230,000. That’s up 9.1% and up 2.4% more than the previous month. Supply is down, prices are up, interest rates are still sub 5%. It doesn’t appear that housing prices will be on the slide in the median or lower priced cities. The combination of low interest rates coupled by the low inventory should keep buyers frantically competitive in as they search for their new homes. It does not appear that anything short of a significant change in rates will soften the aggressive atmosphere we are seeing in the marketplace today. By looking back at February we can see that March brought an average price per square foot of $159.67. This number is a reflection of all home types including single family homes, patio homes (aka townhouses), condominiums, and mobile homes. This is above the previous month slightly. The highest average price per square foot achieved in the last 30 days was $160.24. That happened on March 11th. All in all pricing was not as robust as we anticipated. In mid March the pending status listings were showing an average of $166.06 per square foot average. This number is 1.5% higher from the previous month. Over 96% of the pending sales are non distressed sales (non foreclosures or short sales). Overall the distressed number of sales are below average compared to other years. One notable fact is that short sales are up slightly as a drawn out after-effect from the housing crash. 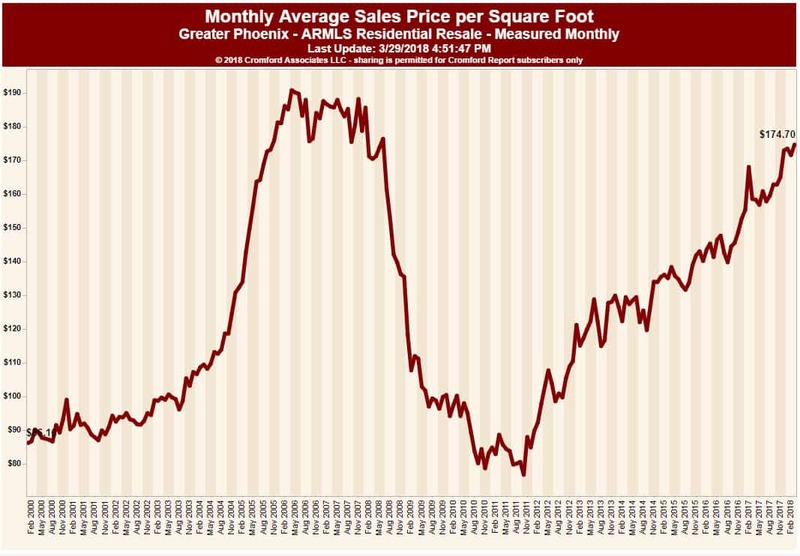 Michael Orr (founder of The Cromford Report) is expecting another rise in price per square foot for April compared to March. Condos are doing just fine in the Phoenix metro. In fact they are up to an average sales price of $174+ per square foot. Condominiums are performing especially well with the shortage of available rentals. Renters are having to pay more for their leases and investors are having to pay more for their cash flow machines. Surely, this will pause soon as the cost of rent does not seem to have much more room to grow. The opportunity to make that cap rate investors are seeking is becoming more difficult and the cost of these units surge upward. Once the rents flatten out there may be a slight easing in condo prices. While this theory may be true it seems that the change won’t be significant for some time to come. The Greater Phoenix housing market is strong. For the time-being sellers still have the upper hand. If you are on the fence about selling it may be time to jump. This is especially true if you are looking to take your equity to move to a less expensive city. Some are strategically downsizing. Lots of homeowners are realizing that they are in homes with a ton of equity locked up in them. Families that have children moving out to go to college or start living on their own are at the top of the list of downsizes. Some are thinking, why not unlock all that equity and buy two places. Sometimes that’s a second home in cooler country. Other times this means buying a condo for their college bound son or daughter. Downsizing can come in all shapes and sizes. If you are contemplating a change we can help you make the right move. Buyers need to be educated before they buy. With the lack of inventory they will have to compete for the more attractive properties. It is easy to overpay. Having an experienced Phoenix agent who will protect you could help you avoid buyers remorse on the highest ticket sale you are likely to make in the next 5 years. Sellers, you are in the drivers seat again. Seems to be the running theme for the last couple of years. A word of caution: with the rising prices there is serious competition for homes. Make sure that your property is positioned to take advantage of this unique time. Failing to ready your house to market could cost you big time. Hiring a part time agent can cost you too. Don’t be tempted by agents or companies who work on a discount. If you think about it, companies who do that probably won’t be very good at negotiating on your behalf when offers start flying around. We specialize in helping our sellers fetch top dollar when they sell. Your bottom line is important. Your equity matters. We are going to help you market your home in order to attract the kind of interest that increases value. Then, once we find that buyer, we will negotiate so that you don’t leave any of your hard earned money behind. Here’s the most recent home listings just added to the database in the average price range for Phoenix. All homes here are priced at $350,000 or less.